So today I finally put all the finishing touches on my sons Lego Tray and I have to say it came out better than expected. So after the paint had dried on the name I routered into two of the sides it was time to clean that up by sanding it, so I used 80 grit upto 320 grit paper to make the name pop. It isnt a bad job for some free routing. Needed to sand the entire tray so I worked up from 80 grit to 320 grit for the entire tray. I also decided that I wanted to router a chamfer along the bottom edge of the tray to give the effect that it is floating on the surface. So I used a chamfer bit in my palm router and did all outside edges of the base. Here is a close-up of the chamfered edge as viewed from the bottom of the tray. Here is a close-up of the camfered edge it really makes the whole tray look like its floating, I love this kind of subtle design element. 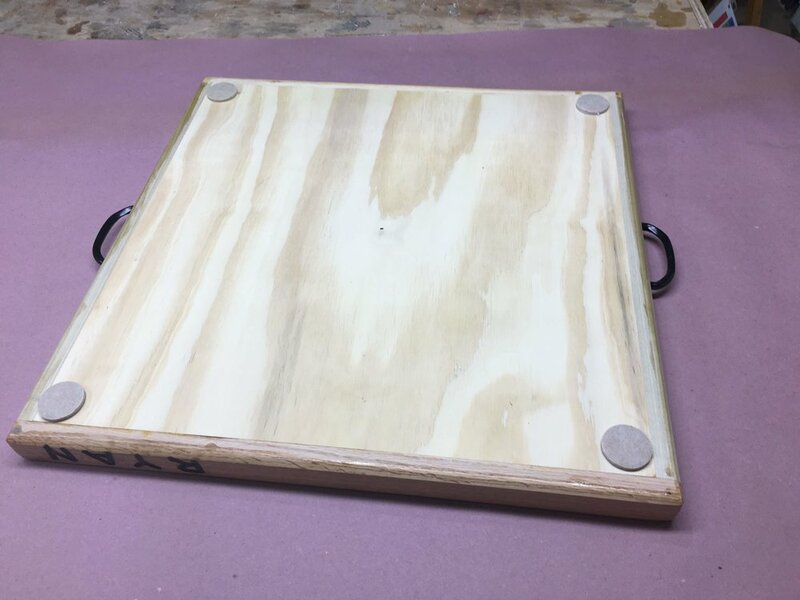 I wanted a simple way of carrying the tray around so I just purchased some big box style handles and attached them in the center of the frame components that didnt have his name routered in. I had wanted to use handles that I made for a project during the summer that I had left over but they were too big to fit on the 1-1/2” wide sides of the trays frame, but these will do. Unfortunately I didn’t get a chance to take any pictures of me doing this step because I had very little time in getting the gorilla glue onto the Lego base-plates and also the wooden base of the tray. The process was pretty straight forward I needed to scuff the bottom faces of the Lego plates and the plywood base so I used 60 grit sandpaper on both, this gives the gorilla glue a place to go to make sure I get a good contact between the 2. Here is me doing the same to the plywood base. Next I used the gorilla glue to adhere the plates to the plywood and after they were fit in I used some heavy paint cans to weight down the Lego bases so as as that I got a good adherence to the plywood. Next I added some felt pads to the underside of the tray that way it would npt mark the wooden floors if it go slid around. Here is a picture of the felt pads. All that was left to do was to apply a finish and I had some oil based polyurethane leftover from the Beer Flight project I had just completed, I applied 2 coats today and that was it, all finished. Below you can see a slideshow of the completed project, this was a super simple project that anyone can make and it will provide hours of fun to children of all ages. Thanks for reading this short blog and I will catch you the next time. 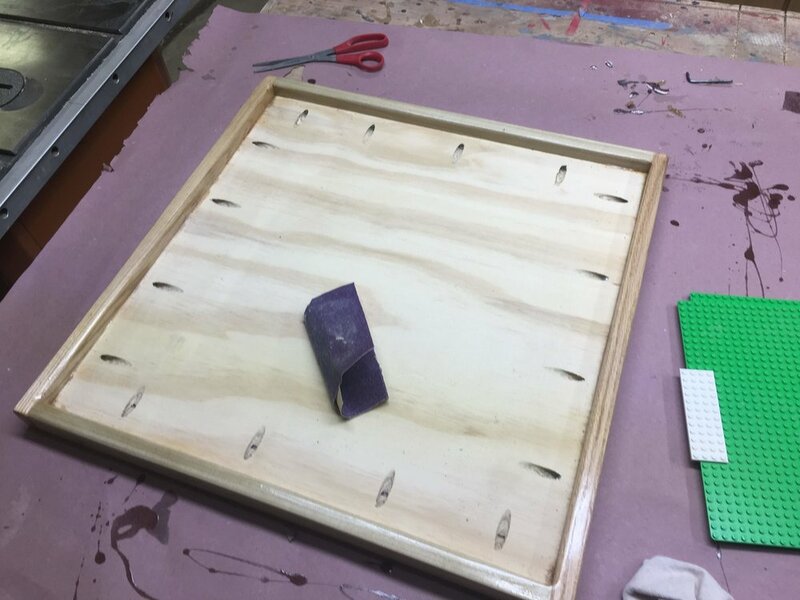 So my wife asked me to make something that my 5 year old son could use with his Lego and I wanted to make him one of those Lego tables with drawers but honestly had no where to put one so I did some research online and found this nifty little project where it is basically a tray that you can set on the floor and build on and when it is not in use he can just slide it under his bed. I didn’t make any plans for this and pretty much made it on the fly using some scraps I had lying around the shop I did need to get some materials and they are listed in this post. I used scrap oak and poplar but you will need a piece of 1”x2” x 8” lumber. Here are all the supplies I got. Here are the felt pads, screws and 2 handles. In order to figure out what all the dimensions needed to be for all the parts and the plywood panel I needed to open all the Lego base-plates and get the overall size and it worked out to 20-1/8” square. so I cut the 3/4” plywood panel to 20-1/8” square on the table saw, and then cut all the wood strips which make up the frame that surrounds the panel. Here is the wood pieces getting chopped to final size. In order to attach the outside frame pieces to the base I needed to added a joinjery system so I decided to keep it easy and just add pocket holes so I just add screws to attach the sides while the glue sets up. I use the Kreg K4 jig and made a station for it where all my accessories for the jig are stored. So I placed 4 pocket holes on each side, below you can see the finished panel and the K4 station. I actually used the router twice in this build, I wanted to add my sons name to the outside edges of the frame so I used my Palm router to freehand his name but before I did that I needed to add some outlines of where I wanted to position the name. Added outlines and even spaces of where I wanted the letters to go. Using my palm router with a 1/4” upcut router bit to carve the letters in. Next I used a sharpie marker to write the letters in, also gives me a visual guide when using the router. Finally his name got carved, I will also adding black paint to the letters to make sure they stand out. Here is the panel all set up in the pipe clamp jig, just about getting ready to screw them home. Glue has already been applied to the inside face of the frame pieces. Here is another image of pipe clamp set-up I used the clamps because when using pocket holes they have the tendency to move the work-piece as you are screwing the pocket hole screws home, this set-up alleviates that. I also wanted to add a round-over to all the edges of the frame so that my son didnt hurt himself on the tray, so I took it over to my router table with a round-over bit in the router and did all the outside edges, then I used my palm held router to get the inside edges of the frame and it came out great but tomorrow I will be sanding it down to make it even smoother to the touch. Here you can see the round-over profile on the outside and inside edges of the frame. I wanted to add some black paint to the carved out letters for my sons name so I used some I had on hand and let it dry over night as I will be applying a polyurethane coat tomorrow. I will be sanding this whole surface down tomorrow which hopefully will make his name pop on the tray. Messy looking right now but I will clean it up tomorrow.